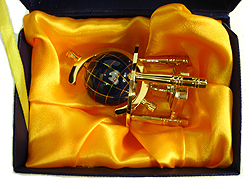 This is known as the tycoon's globe as almost all the rich tycoons around the world will have such type of globe on their tables. 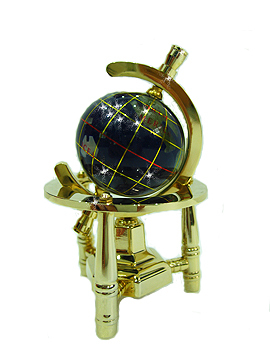 This high quality mini globe is tediously constructed from multiple types of gems carefully crafted to the shape of multiple countries. These natural gems produces strong earth energy required for activation of earth element. The longitudes and latitudes are gold wire electroplated. The splendid base is made from quality brass that is gold finished. This lapis globe would energize your mentor luck, business luck, networking, literary pursuits and recognition luck. Earth energy in globes are important for potency. Crystal globes are made from glass with lead oxide to ensure potency for Feng Shui use. On the other hand, Lapis Lazulli globes are made from gems that are dugged deep under the earth is extremely important to bring out earth energy in globes also. If you cannot decide which one to get, then try to get both if affordable.